Welcome to Bierhübeli, one of the most popular venues in Bern! Located in the center and easily reachable, it offers an ideal setting for various events with music and dancing. We are known for our fabulous parties in unique and happy atmosphere. Visit the regular concerts of the Swiss jazz orchestra or take the stage for your own event. How you do this is totally up to you. No matter if you plan a concert or an art performance, a family celebration like a wedding, a birthday or a great engagement party – you are always welcome at our venue! The heart of this impressive building is certainly the 300 m2 big hall. It contains a concert stage with modern audio and lighting technology and also offers the fitting microphones as well as a DJ desk. Experience events with 800 guests standing or decide on one of the seating options which can be offered for 130 to 440 guests. For smaller get-togethers with a cozy atmosphere our lounge can be booked. On 100 m2 this space includes a bar, which can host 100 guests. During the warmer months you can also keep the Bierhübeli beer garden in mind. 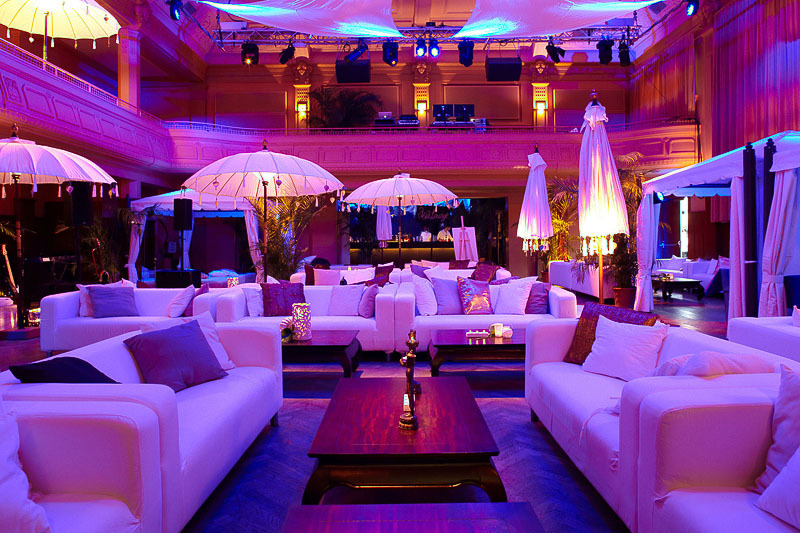 This place offers a quiet atmosphere under its chestnut trees and a pleasant space to step away from the party inside. You may also combine the big hall and beer garden. We have hosted a variety of successful business events. Decide on our venue when it comes to hosting great seminars, congresses, celebrations, team events or speeches. A seating arrangement for 440 people is possible in the big hall which offers the ideal space for any kind of successful event. In addition to that, the provided technology including projectors, screens and a speaker’s desk are waiting to be used by you. If needed, we support your event from the planning to the implementation and we even take care of the decoration. The space can also be arranged for an employee celebration with a theme or even an anniversary. Of course, a high-class catering is crucial to a successful event. Our kitchen team gladly creates a rich aperitif for 650 guests, a classy gala-dinner with up to five courses served on round tables with 130 seats or a festive banquet for 250 guests at long tables. We can also arrange our beer garden for you and 20 guests and host a great barbecue. It will always be delicious due to our special concept. We cooperate with nearby suppliers and make sure that our ingredients are always fresh. This is why we nearly use seasonal and regional foods only. Taste the difference when our catering partner MILLE PORTAILS amazes you with various great meals and beverages! Responsible for the delicious drinks is Vini Cappelletti.